Bookie: Short for sportsbook. Also known as oddsmaker, betting website and fightbook. There are very specific sportsbooks in Canada that focus on MMA and UFC betting. Chalk: The expected winner of the fight or favorite, and usually the person with the best odds; almost always negative odds. Disqualified Opponent: The fight is stopped by the judge or referee, one of the fighters has violated the rules consistently. The violating fighter automatically loses the fight. Draw: Scorecard draw (not to be confused with technical draw). The bet is a push. Edge: What you know that leverages your advantage about the upcoming fight that sportsbooks don’t. The more of an edge you have, the better chances you will walk away with some green in your jeans, all because you took the time to research the fighters. Even Money (EVN): When two fighters are evenly matched, it’s even odds if either one wins. Favorite: The fighter that is expected to win – and almost always with odds that just aren’t worth it. Betting on favorites is always more valuable with undercard fights as explained in our MMA gambler guide. KO: Abbreviation for Knockout. When the boxer does not stand up after a count of 10. Limit: This is the maximum or minimum that you can bet. This is to ensure that you don’t lose too much, or because the house needs to control how much they can pay out. Line: The odds or money line of a fight. Majority Decision: A fighter is declared winner by the judges’ scorecards. Majority Decision is defined when a fighter scores more points on 2 scorecards, but the third judge scores equally for both fighters. Moneyline: An outright bet on who the winner will be. This MMA bet type is expressed in positive and negative values. Negative numbers indicate that the fighter is expect to win the match, positive values mean they think he’s the underdog. Odds: This is the info that determines how the bets will be placed. The better the odds, the less likely that the fighters are matched evenly. There are 3 types: American, decimal and fractional. Learning how to read MMA odds is essential in your betting strategy. Opened: This is what the moneline was when it first opened. The moneyline will shift as you get closer to the day of the fight. Parlay: An accumulator in which several bets are tied together into a single one to increase paying odds. All events have to win in order for the parlay to pay. MMA Parlays are profitable, but risky. Prop Bet: Short for proposition bet, an exotic bet on an occurrence or non-occurrence not directly affecting the fight’s final outcome. MMA prop bets focus on Round Bets and Method of Victory, and the FOTN. Push: A draw in the bet – no fighter is crowned winner, and your money is given back to you. Split Decision: The judge’s scorecard define a winner on 2 scorecards while the third one gives the opponent as the winner. Sportsbook: The online website that will determine the value of the moneyline, as well as where you can actually place your bet. TKO: Abbreviation for Technical Knock Down. The fighter is knocked down 3 times, or when the referee steps in and stops the fight after evaluating the fighter is in no condition to continue. Corner retirements are also TKO´s, unless the judge´s decide the fight by the scorecards or declare a No Contest. Technical Decision: The winner is decided by the scorecard points between the judges (usually 3). Technical decision is settled at any time other than at the end of the programmed rounds. Technical Draw: When the referee stops the fight before the start of the 5th round, for any reason other than Knockout, Technical Knockout or disqualification. Unanimous Decision: The same fighter scoring more points on all three scorecards. 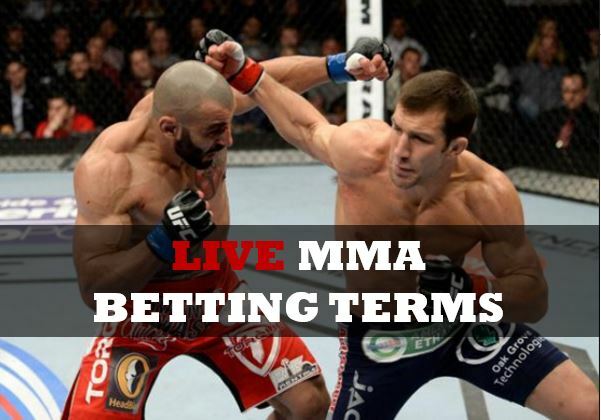 Live Betting: Also known as Inplay bets, these are bets placed once the fight has begun. Live bets include very specific wagers that are only available after the first bell. Fight Winner 3-Way: Betting selections on the 3 most common betting types (win, lose or draw). Draw-No-Bet: Type of bet in which your fighter either wins and pays out, or draws and the stakes are returned. This includes fights that end in Majority Draw. Draw-No-Bet pays lower that a straight bet. Fight Winner 2-Way: Offered on fights where no draw is possible, like Prize Fighter. Fight Outcome 5-Way: Type of bets offered on pre-match. Fight Outcome 4-Way: Offered on fights where no draw is possible, like Prize Fighter. Total Rounds 2-Way: Type of Round Bet in which the last Round fought is used for settlement purposes. If the fighter retires on his stool between Rounds, 4 and 5 for example, then Round 4 will be settled for the Round Bet. Round Groups/Round Betting: A bet on the exact round the fight will finish. The fight can be determined by KO/TKO, submission or disqualification on that specific round. If a fighter retires in between fights, the previous Round will be settled as that was the last full Round. In the event of Technical Decision before the fight ends, all bets will be settled as winner as per Decision. To Go the Distance: A bet on the fighters completing the full number of Rounds designated. Method of Victory: A bet based on how the fight will end for a particular fighter. KO/TKO, Submission or Decision. Points Handicap: A bet on the over/under total points on the judge’s scorecard decision. All 3 total scores are considered. FOTN Props: Prop bets on “Fighter of the Night Awards”. The three awards are Knockout of the Night (KOTN), Submission of the Night (SOTN), and Fight of the Night (FOTN). FOTN: A bet on which fighter will win the Fighter of the Night Award. KOTN: A bet on which fighter will win the Knockout of the Night Award. SOTN: A bet on which fighter will win Submission of the Night Award.